Our Stockholm cruise port guide gives you information about the docking location, cruise dock, transportation options and much more! 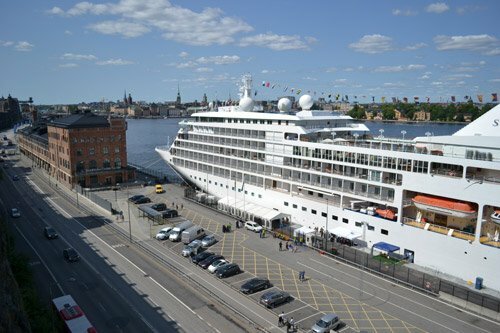 Welcome to the Stockholm cruise port guide. The capital city of Sweden has about 870.000 inhabitants. It is a beautifull city that is divided over 14 different islands. Stockholm itself is a city of culture. You have tons of options on what to see and do. Visit 1 of the 70 museums in the city, learn about their history or simply take in Stockholm’s legendary city atmosphere. There is something to do for everybody. Every single island in Stockholm is unique. They all have their own identity and style. This is what makes Stockholm a true gem to explore, because there is always something new to explore. The people of Stockholm are extremely nice and you will notice that most of them are very well educated. Their English is often perfect and they wouldn’t mind at all to talk about their city that they are so proud of. Gamla Stan is the old town and is simply the part of Stockholm you cannot miss. Djurgarden is nowadays a recreation park with museums, amusement parks and the famous former hunting grounds of the king. Sodermalm is where you’ll find the charming older neighbourhoods of Stockholm. Norrmalm is where you find the modern business district and shopping area. Find all the information about your docking location in the Stockholm cruise port guide underneath. The city of Stockholm lies on 14 islands and that is why it sometimes can be quite time consuming to get around and not ideal to do by foot. Therefore we recommend the ferries, metro, taxis, buses or even the bicycle. 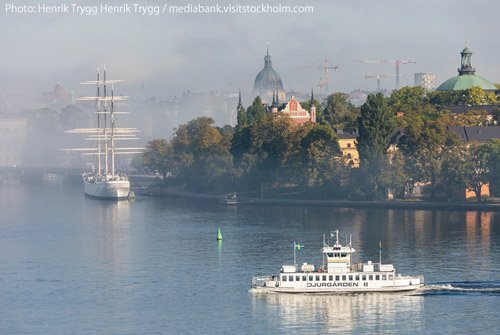 Be sure not to miss sailing into Stockholm. Your ship will have sail past 30.000 islands for hours to be able to reach Stockholm. The ideal transportation in Stockholm is the local ferry. Pretty much all the cruise docks around town are connected to the local ferry. It is easy to use, cheap and it is a fast way to get around all of the islands of Stockholm. How are you? – Hur mår du? You can recognise the taxis in Stockholm by their taxi sign and have a meter. Sweden does not regulate prices: they might vary greatly. It is the customer’s responsibility to check prices beforehand. Usually on the rear door window you will find a yellow label that has a fare on it. This is the fare based on a 10 km, 15-minute journey. Taxi you can pay by cash or credit card. Public Transport in Stockholm is widely available. The one thing you need to know though is that you are not able to buy your ticket on the bus or tram. You need to pre buy your ticket at a tourist information point, Pressbyra convenience shops, bus stop ticket machine or SL Centers. No matter where you dock the hop on hop off buses will make it work to be there waiting for you. Since Stockholm is spread out over 14 different islands it is not a bad idea to take one. This cruise dock is about 3 km’s from town. There is a tourist information available. The ships usually have a shuttle bus to town, but check this with your front office. There is also a local ferry that docks right next (to the east) of your ship. This you can take straight into the city centre. There is also a local bus available at about a 10 minute walk. This is bus nr 53 that departs from the Folkungagatan station. Please know you need to buy tickets for local transportation in advance through the tourist information stand at the pier. Taxis from here to the city centre should cost no more than 150 SEK. From here it is about 4 km to the city centre. Cruise ships should provided a shuttle bus although this is not always the case. Check what will be the case for your call with your front office on board. If you dock at the 638 Frihamnen there is a tourist information in the terminal or if you dock at the southern part of Frihamnen there is temporary tourist stand that usually comes to the pier. From here you can take the local ferry from port to the city centre or local bus nr 76. Please know you need to buy the tickets in advance through the tourist information to be able to ride the bus or buy the tickets at the bus stop machine. There is free wi-fi in the terminal. Taxi prices are on display at the terminal. This dock is where only small ships can dock. If you have the privilege of docking here you are right in town. Your ship will berth right at Gamla Stan Old town. Tendering is what usually guest and crew want to avoid, except when you are talking about Stockholm. It might cost you a bit more time, but in the case of Stockholm they tender you right into the old town. It is a very convenient spot and unlike the other docks you don’t need any transportation anymore once you set foot on land. The city centre is right there in front of you. The tourist information usually comes with a small information booth for a couple of hours. Buses and ferries are right there for you at the dock. – Which hop on hop off bus is the best in Stockholm? It’s a close call. We would recommend the green bus. – Where can I rent a bycicle in Stockholm? Either get a renting card at the tourist information or find loads of rental places on and around Djurgarden. – Can I buy a bus ticket on the bus? No, you cannot. You need to prebuy them from the tourist information, from the machine or at the SL centre. – Is Stockholm still situated on the Baltic Sea. Yes, it is. 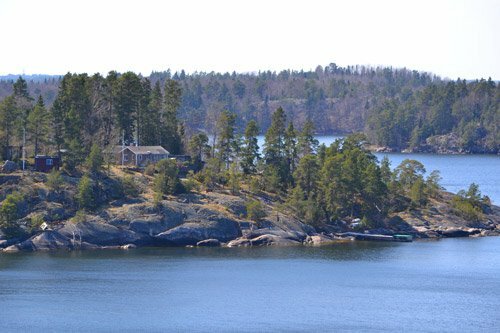 The island Gamla Stan literally seperates salt from fresh water and so on the east side of this tiny island you’ll find officially the Baltic Sea, but with many Stockholmers also known as the archipelago. Scandinavia is known for its ice bars and hotels. In the city centre of Stockholm you can find an ice bar. Visit this bar to get the polar experience as you sit at the ice bar, on your ice chair with your ice glass. This is one of the most important buildings in Sweden. It is famous for its grand ceremonial halls, unique architecture and striking interior. Take a tour inside and get the inside look in the meaning behind this mosaic golden hall, the nobel prize banquet and the city of Stockholm. This landmark in Stockholm is the Ericsson Globe. Take a 20 minute ride in the SkyView: the world’s largest spherical building. This well known amusement park on Djurgarden has 30 rides, lots of restaurants and often summer concerts. If you want to experience something different make sure to check their agenda to see if anything special is going on. Sweden has some of the best shops in the Europe. If you are in the shopping mood make sure to kick off at Drottinggatan. This is the largest pedestrian shopping street in Stockholm. The Tyska Kyrkan is one of the many churches in the old town Gamla Stan. This building dates back from the 1500’s. Visit the church between 11 am and 5 pm to witness the 350 year old pulpit and much more. Since may of 2013 Stockholm is enriched by the ABBA museum. These Swedish supertroupers are known world wide for their many hits in the 70’s and 80’s. Visit the museum for a trip down memory lane. Be sure to do it, because it is one gigantic party here! Make recordings with the group, dance to the music and test your ABBA knowlegde! 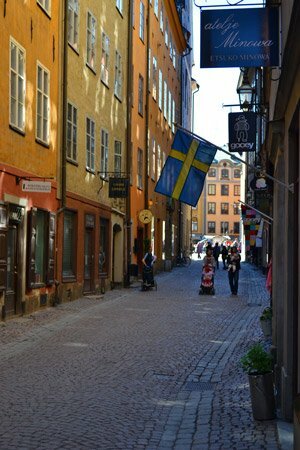 This is Stockholm’s old town. 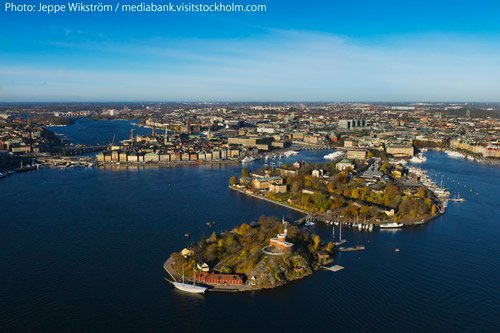 Situated on the island of Riddarholmen lies one of the best preserved medieval city centers in Europe. This is where Stockholm was founded in 1252. It is filled with lots of museums, attractions, restaurants and cafe’s. A visit to Stockholm is not complete without it. When talking about the Royal Palace it is very important to mention it is 1 room bigger than Buckingham palace. It is open to the public and you can visit one of the museum inside. You can also meet the royal guards that have been guarding the palace since 1523. The changing of the guards is also a popular attraction. They start at the Cavalry Barracks and than march to the Army Museum. They arrive at the palace around 12.15 (on Sundays around 13.15). This is one of the most visited museums in Scandinavia. It houses the famous Vasa ship. This Swedish warship was built in the 1620’s and sank on her maiden voyage to the bottom of the Stockholm waters. For 333 years it was raised to the surface again and nowadays you can find it in all of its full glory in the Vasa Museum. This grand museum in the middle of old town Stockholm tells the story of the Nobel Prize and its founder. It aims to spread knowlegde as well as to create interest around natural sciences and culture. The National Museum of Stockholm is closed due to renovation. It will reopen in 2018. Find out on their website were they hold their temporary exhibition. If you want to espace the crowds of the city Drottingholm palace is the perfect place to go to. This UNESCO world heritage site is a well-preserved royal castle from the 1600’s. Inside you will find lots of rooms in their original interior telling you about the times of the international royalty and nobels. Visit it by taxi or take the ferry from the city hall in the city centre.